In the recent "Summer Salon" group show at Windham Art Gallery, three paintings by Lesley Heathcote were shown. All depicted dreamlike natural themes, and one was entitled "When the Bears Wake Up," an 18" x 22" oil painting on canvas (displayed in the back gallery during September). 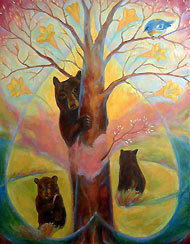 "When the Bears Wake Up" is a warmly toned, dreamy reflection of Spring. The magical gaze of a mother bear meets us as she looks from behind a tree, the trunk of which she is marking with her claws. She hugs the tree like an old friend, one she has not seen since she last crawled into her hibernation many months before. There is a bit of that "just woke up" look in her expression; even so, her eyes meet ours with firm, gentle power. Two cubs stand by her, one before and one behind. The latter is looking away from us, but the former looks out with wild eyes that seem a bit drunk at first, and perhaps they are excitedly intoxicated with the myriad of sights, sounds and smells of the surrounding forest. There are many paradoxes in this painting. First of all, the gentle intensity of mother bear's gaze is a hypnotic moment abruptly broken by instinct as one remembers the old wisdom: a mother bear with cubs is one of the most dangerous things in the forest. That moment of awe could cost you your life, and those cute little cubs are the reason for such protective aggression. No petting, please. . . .
Second is that loving embrace of the tree. Remember those bear hugs you got as a kid? This familiar embrace will rip through the skin of a trunk, leaving a territorial message for all other bears and smaller creatures to heed: You are in the wrong place, and you better hope it's not the wrong time! In general, this painting flits back and forth between detailed reality and a sort of dreamscape. There are many mystical elements, and letting go of the bear's gaze momentarily allows one to explore them. A soft haze surrounds her, weaving in and through the tree. It is painted in a pinkish hue and seems almost to have a sweet, Springlike scent; surely it does to the bear. In fact, it might remind us that to all forest creatures the world is a cornucopia of scents, a garden of telling aromas. The feeling of Spring is further conveyed by the lightness and color of yellow flowers growing in the tree. It takes a while to notice these, and it's a bit surprising to see the large blossoms arcing in a corona around the female bruin's visage. They are growing in the tree, and tree and partner begin to seem dreamlike. They could be a Wicca projection or a shape-shifting shaman in the beast's form. Indeed, the artist has said that the painting was at first inspired by the dream of a bear asking her to heal its leg. Not the subject here, but the impetus and perhaps an influence on the title: "When the Bears Wake Up." Now about those flowers. . . . Asked about the variety, Lesley said that they are weigela, a flower which grows on a large shrub and blooms in May and June. She explained that they "appeared there" and then she decided to leave them. The artist has also said that her work found its way after she began to "let the images emerge on their own." This type of thinking or process is very different from the capturing of images done by a camera. Photography was her concentration at Rhode Island School of Design, where she received her undergraduate degree. I looked up weigela in the 1943 edition of Wild Flowers in Color. According to that reference, there were no yellow weigela, only varieties of pinks, reds and whites. No matter; one might have trouble accessing the sources of Hieronymus Bosch's characterizations or explaining Picasso's Cubist facial anatomy. But these yellow weigelas convey something special. In combination with the other elements of the picture, they give us a feeling of wonder. Wonder of nature, wonder of our dreams, and wonder in the simple sense of awakening to nature or a spiritual reawakening of the soul. The spirit in nature, the spirit in ourselves and the oneness these two encompass. That is what we feel. Like the wonder experienced by pre-media folk gazing on Botticelli's Venus or the scary wonder of a Jacob van Ruisdael landscape, and the mysterious presence sensed in them. Heathcote shows us this spirit in nature, and through her many paintings it is represented in a myriad of forms. One I saw recently and cannot forget was of a whale's tail just before submergence. Then there's the painting she showed in a group show at The Common Ground Gallery, "Serefina." This painting was of a Woman becoming Tree embraced by Snake (a large yellow boa). In fact, the feminine spirit is entwined with nature in some way in many of her paintings. From studying them, one might conclude that Nature is female. Lesley Heathcote left New York City to join the Brattleboro community of artists three years ago. Looking at her work now, it seems that she couldn't have gotten here from there. Rarely has artist and nature been so profoundly united. She is a member of Windham Art Gallery and has not had a one-person show in the area yet. One thing that has developed since she began exhibiting locally is her use of color, which she has admitted struggling with and feels that its content is emotional. She has noticeably broadened her tonal range in the last few years. To see more of her paintings, watch the local group shows or give her a call at (802) 257-0951; she welcomes visits to the studio where her oeuvre, her world of images, may be viewed more completely.